Everyone had predicted that Nepal’s mobile phone network would be destroyed during a catastrophic earthquake leaving survivors with no means of communication. The cellular network survived the 25 April quake, but it is now facing an enormous challenge convincing homeowners to allow transmission towers on their roofs. Fearing the additional weight of the Base Transmitter Stations (BTS) will increase risk during future earthquakes, many want rooftop towers to be removed. And telecom companies are finding it difficult to find new sites for their towers. “The number of base stations has come down by half after the earthquake, and this has affected services,” admits Achyutananda Mishra of industry regulator Nepal Telecom Authority. After the earthquake, private operator Ncell had immediately deployed vans with transmitters and temporary transmitters called ‘cell on leg’ providing services in areas where the towers went down. Nepal Telecom had put its contingency disaster recovery plan into action with minimum disruption. A few buildings with towers collapsed and others were damaged, and the perception spread that they had gone down because of the towers. Both Ncell and NTC are now facing problems convincing homeowners who had rented their rooftops to let their base stations stay. 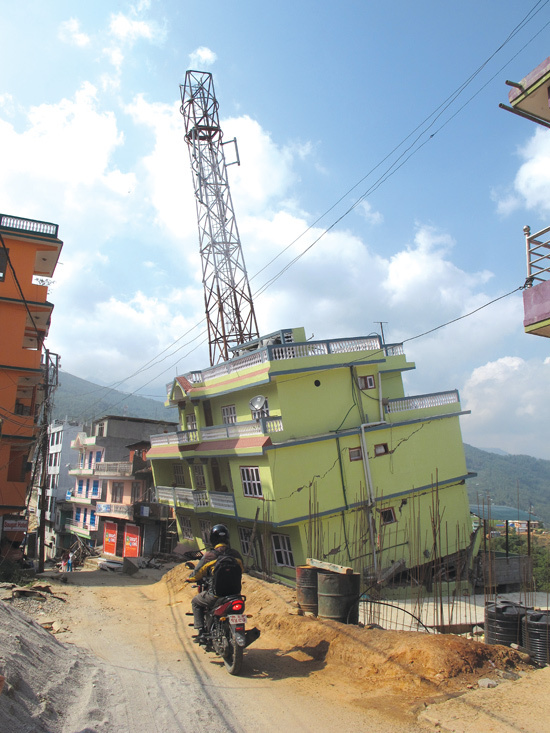 Thirty of Ncell’s towers, 37 of Nepal Telecom and seven of UTL in Kathmandu Valley have been dismantled since the quake because even owners whose buildings were not damaged don’t want them there. This is happening more in Kathmandu Valley than in other districts. Telecom companies are also finding it difficult to find houses that have a completion certificate that they followed the building code so new towers can be put up and replace damaged ones. “Even in houses that are safe, people are scared to lease out the roof due to fear of the earthquake,” said Prativa Baidya at Nepal Telecom. Most tall buildings in Kathmandu have flouted rules to add floors or have violated constructions norms. “It was really not a technological disaster.” said Andras Pali, Chief Technical Officer of Ncell. “We lost 20-25 sites as a direct impact of the earthquake. But these were where the house itself was damaged. There was not a single site where the tower fell off the roof. The newer towers weigh less and don’t add to the structure,” he said. The earthquake has also become an excuse for some house owners to jack up rentals for allowing base stations on their roofs. Some are said to be asking up to five times more rent from telecom companies. With 5,600 base stations all over the country, the costs will add up and telecom companies may pass that on to consumers. To ease congestion and reduce the gap in services, operators have deployed dozens of mobile vans in parts of Kathmandu with high population density where buildings with towers either collapsed or had to be dismantled because owners didn’t want them there anymore. But these temporary measures are expensive and are not a long-term solution. Nepal Telecom is reinstalling about ten towers that were dismantled after the earthquake and is also working on pole-mounted BTS where it can’t find buildings to rent. Ncell on the other hand is concentrating on modernising and doubling the capacity of its network in Kathmandu Valley. Both operators say it will take the cooperation of house owners for their services to return to normal. They also want the government and the NTA to be more proactive in enforcing the building code and raising awareness among house owners that telecom towers do not bring houses down in an earthquake but that shoddy construction does. NTA is said to be refining the guidelines which includes one for getting approval for installation of BTS towers and standards of houses. Telecom companies say the NTA should also take into account the places where people may go to take shelter in the aftermath of disaster so that they can build robust networks there.